With no password set using bootable disks, OS Live CD/DVDs, bootable USB/Flash disks someone can harm your system and access your personal files. 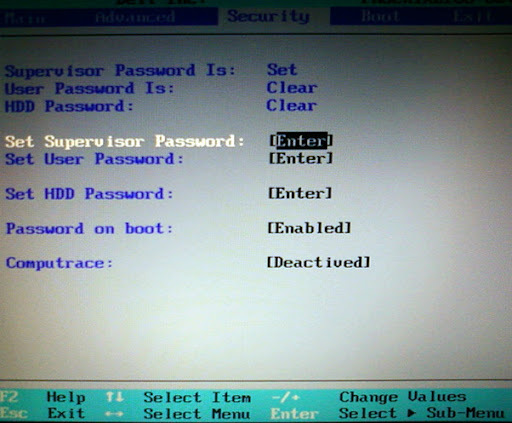 But if you configure a BIOS supervisor/administrator password, it would require to enter the password in order to enter in BIOS setup and change the boot sequences. I know would be a hustle to enter a password in the time of Face Recognition, Fingerprint, Eye Retina and other biometric logins features. Safety comes first. It will also protect your BIOS (Basic Input/Output System) from BIOS viruses like CIH (Chernobyl Virus) and other infections, which can otherwise completely destroy your motherboard. Note: I am not comparing this method with Hard Disk Encryption this time, that's a different topic. How to enable BIOS password? 1. Depending on the brand of motherboard/Desktop/Laptop there would be different BIOS like American Megatrends (AMI) BIOS, Phoenix BIOS or any other. Boot your system and enter in BIOS setup. Well, you may need to press F2, F8, F12, or Delete button depending on the manufacturer to enter in BIOS (Read the message on BIOS post). 2. If you have entered in BIOS, look for Security tab. Press tab or scroll key to go to the security tab. Here you will find Enter Password/Setup BIOS Password/Enter Admin Password/Enter Supervisor Password or so if you haven't yet set any password. Type the password and save. Now whenever you enter in BIOS setup, it would require to enter a password. You may also enable BIOS to prompt for password everytime you boot your system. 3. You can revert back and clear the password you remember the password and don't want to protect your system.